Jameela Pedicini described her investment priorities. The first panel was called “Deleveraging Portfolios away from Fossil Fuel Investments to a Clean Energy and Sustainability Portfolio — Why Now?” It was moderated by Jim Malatras, president of the Rockefeller Institute of Government. The event was cohosted by the State of New York. It is crucial to look at investment decisions “through the prism of risk” by watching where the puck is going, said Jameela Pedicini, executive director of asset management at Perella Weinberg Partners. This is better than having a simplistic binary focus on fossil-fuel divestment. Environmental issues are multifaceted and social justice criteria should be included. There is a long way to go to transform the economy toward renewable energy sources. Sustainable energy choices are necessary for both profit and survival, according to Gerry Watson, vice president for finance and operations at the Rockefeller Brothers Fund. 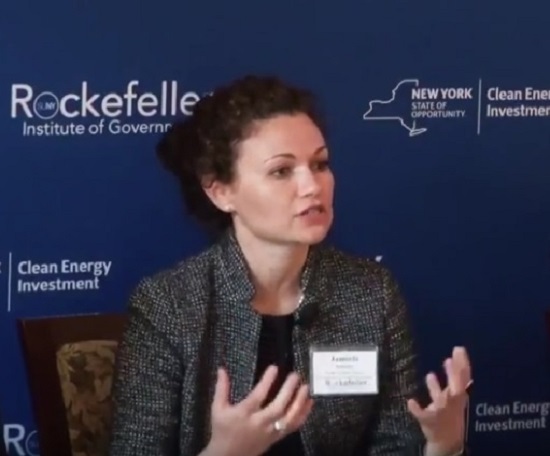 The rapid pace of technological and market transformation is exciting, said Alicia Barton, president and CEO of New York State Energy Research and Development Authority (NYSERDA). As investors see the puck travel down the ice and are trying to assess risk, they are confronted with decisions about their new alternatives. Technological changes are breaking records. The quotes below have been edited for length. Malatras: We’re here today to explore how to leverage large institutional funds to drive the cleantech economy and maximize investment returns. This is an important meeting today to help us shape a blueprint for the decarbonization of the [New York state] pension fund. The first panel of experts will discuss how we deleverage portfolios away from fossil fuel investments to a clean energy portfolio. It will really dig into why the timing of this activity is right now. Watson: We had for numerous years tried the engagement process through our investments. Climate change is a process that for the past 20-something years we’ve felt is critical to the survival of the world and all of us. We must address it, we must battle it, and we must try to really reverse the impacts and stop the damage. Initially, like many institutions, we were engaging with our investments that were in the oil companies primarily through the efforts of the family - like putting out shareholder resolutions. And we felt over time that as we were spending more of our dollars on fighting climate change, we felt more uncomfortable that in our portfolio, we might have certain investments that are directly undermining the dollars that we were deploying for the grants. We came to the conclusion in the summer of 2014, right before the United Nations call for the battle of climate change and the call for divestments, that this was a step we needed to do. We were one of the initial funders of the Carbon Tracker Initiative years ago. We have studied their research for many years. We were really persuaded that for a moral and financial return, this was the right step to do. In 2014, we announced this. We try to be transparent. We monitor our progress. You can go to our website and see how we’re doing. Our mandate as a foundation, which we revisit every 10 years with the trustees, half of whom are family members, is the question of many foundations: Are we sundowning? Or are we in existence for perpetuity? We continue to have the goal of perpetuity. In order to do that, we need to have financial returns that preserve the purchasing power of the endowment because we want to have a robust grants pool. We are balancing both needs. Barton: We are making progress faster than people anticipated a few years ago. These are good investments with sustainable long-term returns. They’re also the best growth areas. It’s not surprising that this would be the right moment for consideration of a broader strategy. That’s why it was so exciting to see the governor really leaning into the comprehensive ways to think about this issue in his State of the State address earlier this year. He called on the common fund to divest, making New York the first state to make such a commitment, which was really incredibly exciting. He followed that up to show that we’re serious about doing the work by announcing in coordination with state comptroller Tom DiNapoli that the state was forming the first decarbonization advisory panel to really do the hard work. [The panel is looking] at ways to leverage that opportunity to drive more investment in clean energy markets that we’ve already been triggering for private investment through the suite of other products we’ve been working on. This is an exciting time for New York to be playing such a leadership role. Malatras: How is this the right moment? How can you construct a portfolio where we’re divesting? Watson: We track against benchmarks. We track against a conventional benchmark and a fossil-free benchmark. To have a meaningful period of time, you need 10 years. But one of the parameters we are tracking is that in 2010, the MSCI has been tracking the trend between the conventional equity versus the equity without fossil fuels. In 2010 through 2014, they were pretty much tracking almost identically. But since 2014, the fossil-free one is ahead. As of this morning, it has [scored] about 210 in cumulative positive performance since then. The conventional one is at 199. That’s not a huge spread yet. That’s one piece of evidence. We need more, long-term, to really have a concrete case. Malatras: What’s driving the positive return? Pedicini: I think the question is, “Where’s the puck going”? If you close your doors today, how are you going to still pay pensions in 40 years or 50 years? I think we can all probably agree in this room that the world’s going to be very different in 50 years than it is today. On a variety of fronts, like artificial intelligence and climate change, looking at technology, there’s going to be disruption in a variety of sectors. Where’s the puck going? Look at not just the issues of decarbonization, fossil fuels, and the traditional energy industry, but look at environmental risks. It could be climate change, carbon emissions, resource scarcity, human rights issues, supply chain resiliency, governance or independence. All of these issues together, when you are thinking about them as an asset owner and you are looking at both publicly and privately listed companies, matter not just in terms of representation. They matter in terms of value and in terms of performance. They play out in different ways in different time horizons. I would reframe the question. It’s not about the context of looking at divestment as an action. It’s looking at the policy risks in terms of the portfolio. What does that mean at both the macro and micro level? Opportunities will arise in looking at new insurance products. Look at it through the prism of risk in the context of where the puck is going as opposed to thinking of it as a binary divestment from fossil fuels versus investment in fossil fuels issue. Unfortunately or fortunately, it’s a very complex gray discussion. 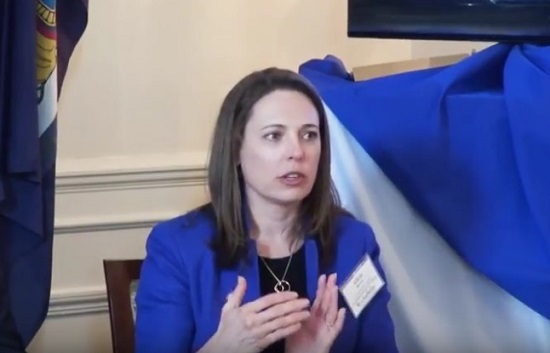 Alicia Barton described the New York policy landscape. Barton: As an investor, as you see the puck traveling down the ice and you’re trying to assess risk, you are confronted with the decision: What are your alternatives then? This is a very different conversation today than it was three years ago, let alone five years ago, let alone 10 years ago, with the incredible explosion of growth in renewable energy markets and clean energy markets globally, nationally, and in New York. State policy is a significant driver of that growth. There is no way we’d be seeing the amount of activity in renewable energy markets that we see in New York without the forward-leaning policies we’ve had in the past few years. It’s very much a confluence. You’ve got forward-looking policy. At the same time, you’ve got technology improvements that are shattering records. You’ve got these newer markets reaching scale because they’re getting more cost-competitive and they’re growing even faster because the costs are so attractive. In the United States last year, virtually all of the new installed capacity was renewable. We really have reached a point where if you’re looking for where the growth opportunities are as an investor, it’s all in the renewable energy space. Many of the oil and gas companies in the United States are seeing this and are adjusting their own business models as well. A video and photos are available on Rockefeller Institute of Government’s website.